In her most recent work, Suzanne Betz places acrobatic ﬁgures in a color ﬁeld of warm black. As with actual acrobats, their performance is a dance with gravity — defying its forces, playing within its boundaries, and intuitively understanding how it supports the body. While the ﬁgures in these paintings appear to be affected by gravity, Betz provides none of its usual visual referents, such as the sky or ground, any up or down. What keeps them from ﬂying off into space or off the page? The isolation of the ﬁgures and the slightest suggestion of facial features allows us to focus on their actions, which we feel would require physical exertion. Yet the hanging, jumping, and balancing of the figures seem effortless, and their agile bodies appear somewhat childlike. After taking in the strong, simple outlines, you begin to notice strange little awkward bits: the pole or yardstick running down the side of two ﬁgures, the partially-seen leg or foot in two others. Borders are curiously blurred: the red ball merges into a foot, ﬁngers and toes bleed into the black, and knees seem to glow. Such effects do not allow the ﬁgures to sit easily. Their hidden or hanging limbs and their equipment lock them into place, but Betz’s use of irregular lines and variable tones makes them almost twitch. The artist places the ﬁgures off-center, which also creates tension as we mentally try to square the ﬁgures – just like we have the urge to even an unleveled picture frame. As depicted, the acrobatic equipment is the very stuff of an artist’s vocabulary, the line and the sphere. Within the small paintings, we are aware of Betz’s own balancing act in which the ﬁgures hover between representation and conﬁguration of line and color. The reason the acrobats don’t ﬂy off into space is that the artist wills them to be there. The illogic, the deliberate awkward bits, the restlessness do not permit a ﬁxed reading nor a complacent acceptance of simple illusion. Our eyes meet those of an acrobat, and at the same time we know this is a painting. Luring us into her paintings, Suzanne Betz creates delicious ambiguities that allow us to entertain possibilities. Perhaps best known for her paintings of horses, she sets these splendid animals in color ﬁelds, often black, with no horizon or ground. However, as she insists, the black is not a void but is “supportive.” Just as sound becomes music when there are intervals between notes, the negative spaces in a painting — what is left where there is no object — can create an abstract expression of their own. As the artists suggests, what is left unspoken can often be more intriguing than what is said. Her paintings begin with the drawing. Betz has a strong command of traditional rendering, in which the two-dimensional line creates the quality of the three-dimensional. She has a tendency to place the horse in proﬁle, which provides the strongest sense of what the form is. As such, her horses are almost classical, like those found on the Greek Parthenon, but the purity and solidity are there as a point of departure for her intuitive working method. Betz’s studio is set up for “instant availability” of materials. An old car window serves as a palette, and her gouaches and watercolors can be reawakened with a touch of water. These paints and water-soluble graphite pencils are favored, because they are not correctable. “You cannot undo it,” Betz says, and she chuckles as she observes that this is like life itself. Her fearless additive process means that her paintings are records of the sum of her actions. You see the trace of the artist’s hand in the free play of line, the translucency of paint, the rhythmic application of tone. In addition, other than conservation principles, she rarely uses materials in the “prescribed fashion,” which enhances the feeling of openness, exploration, and receptivity. Betz’s vivid rendering of horses makes us feel that we can almost hear them snort and whinny, but the attention to the tactile properties of a painting arouses our sense of touch. 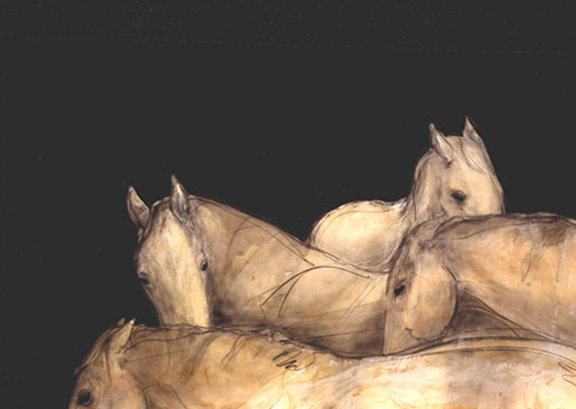 Informed by her daily close contact with horses, the artist dwells on their curves, further stimulating our impulse to touch. The basis for Suzanne Betz’s art is her attunement to the physical world and its resonance with the metaphysical. This never-ending process of engagement is centered in her relationship with and understanding of horses, especially her retired polo pony Mister. To speak with her about these intelligent, noble animals is to encounter a true study or discipline. Drawn to them since she was a child, Betz calls them “a perfect mirror” reﬂective of the person working with them. Ever since humans created art (or art created humans), we have been drawn to horses, and the earliest representations seem to represent their totemic power. Political authority has reinforced its rule with equestrian portraiture, in which kings subdue their ﬁery steeds. More recently, they have been portrayed as objects of ownership and entertainment. Betz paints the horse in its own terms. Respectful of the physical strength of a thousand-pound creature, her relationship is an empathic exchange. Horses can communicate through body language. If you watch horses in a ﬁeld, you immediately notice how they interact and position themselves in deliberate ways. Their placements can almost appear aesthetic in themselves, but they also carry a social meaning. 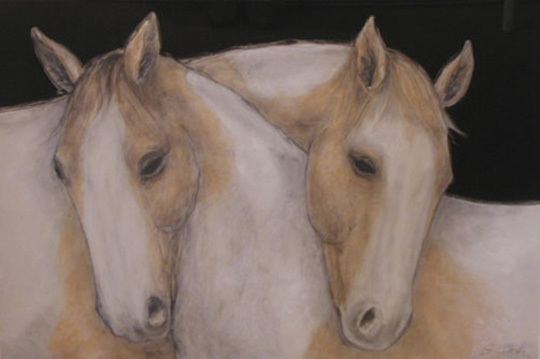 In her art, Betz links horses in pairs or groups with considered gestures of their heads and necks. For example, a head over head association indicates affection and bonding, which is intensiﬁed by grooming or scratching. We sense some purpose without necessarily identifying it. This provocation of the viewer’s curiosity into another world can turn into a confrontation with the mysterious – a major component of Betz’s work. In Reunion #2, there is a series of nine squares in a single mat. Androgynous ﬁgures coexist with spheres, whose shape correspond to the bald heads of the ﬁgures. Can we say the ﬁgures interact with the spheres? Reading from one square to the next, there seems to be some sort of tacit choreography. Yet how do we read the three squares in the middle? Are the ﬁgures hovering sideways in space? or has the artist merely changed the rules of the game? Are the ﬁgures involved with some sort of game with the ball? 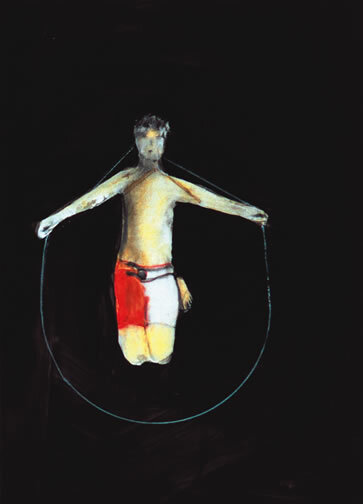 Using the oppositions and paradoxes available to the artist, Suzanne Betz allows us to walk the tightrope balanced between the known and unknown, the named and intuited: the moment when the hair on the back of our neck rises, and we don’t yet know why. Rather than tie our experience to gravity, we can enjoy the delicious exhilaration of suspension and just let go.